LiVES, a free video editing system and VJ tool, now is at version 2.2.6, which updates for gtk+ >= 3.10.0. LiVES is designed to be simple to use, yet powerful. It is small in size, yet it has many advanced features. 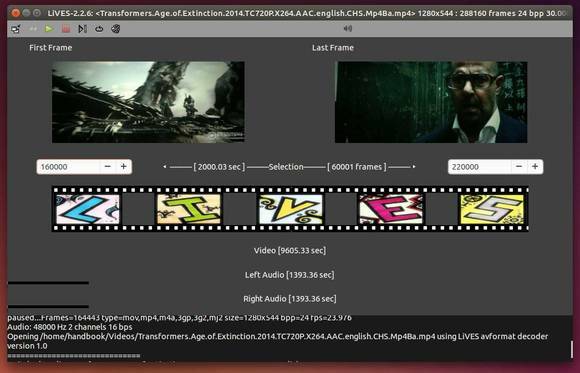 Support multiple video formats via mplayer, mplayer2. Extendable video and audio effects via plugins. Support for remote control via OSC protocol. Video capture from FireWire cameras and TV cards. Lossless backup and crash recovery. Fix startup bug (regression) creating config file incorrectly. Add support for freenect camera. Above commands will remove LiVES as well as the PPA from your system and update the package lists.